The best gin cocktails in the inner west can be had at Imperial Measures Distilling's recently opened distillery door and tasting room, Ounce Bar. It’s been a busy year for Imperial Measures’ David Danby and Chris Jones. The duo moved into their West Thebarton production warehouse in February, released Ruby Bitter in June, extended their distribution nationally, and they’re capping off the year with the launch of Ounce Bar, their distillery’s freshly minted cellar door. 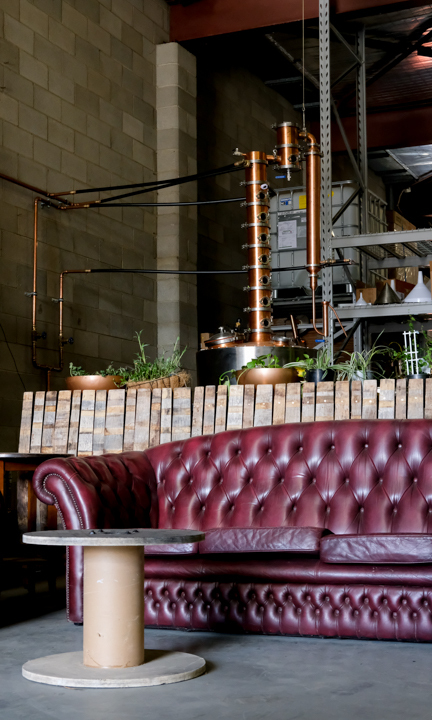 Imperial Measures Distilling was first conceptualised while David and Chris were working at Hindley Street’s Apothecary 1878, and so it makes sense that hospitality would always be part of the facility’s offering. “We’re bartenders, of course we want a bar,” David laughs. Ounce Bar spans two distinct areas at the warehouse: a front bar featuring the full Imperial Distilling range, a complementary selection of back bar items from which to make custom-order cocktails, a single beer tap, and a concise six-item wine list; while around the corner is a more spacious area with a large communal table and several soft furnishings, including a Chesterfield lounge just out of arm’s reach of their Australian-made still. Share a seat with Imperial Measures’ still. “You can literally almost touch it,” David says. The venue has a 30-person limit that can be extended for functions, but the limited capacity will allow a more personalised experience, David says. David and Chris stress that the offering is a bar within a distillery, and they have no intention of being anything more than a ‘friendly, comfortable, and relaxed’ cellar door. Ounce Bar does introduce a high quality cocktail offering to the inner west’s burgeoning booze scene though, complementing the craft beer offerings of their neighbours The Wheaty, West Thebarton Social Club, and Pirate Life’s Hindmarsh brewery. “Maybe in the 2.5k radius, this is probably the best cocktail around,” Chris says. “It wasn’t our intention, but it’s 50 per cent of our trade,” David says. Having a bar as part of the distillery also allows for experimentation. When CityMag visits, Chris is quick to offer a hibiscus sour made from a house-made hibiscus liqueur. Ounce Bar opens five days a week, Wednesday to Thursday and Saturday to Sunday from midday to 5pm and Fridays from midday to 9pm, and they’re already attracting a broad range of clientele. “My mother-in-law came here and she was like ‘Oh my God, I can’t believe what you’ve done. I’m going to bring all my gardening mates in here’… We’ve also had people come in and say ‘21st – bang. This is the place for it,’” Chris says. The opening of Ounce Bar also signifies the culmination of the vision Chris and David had for their business from the very beginning. “It’s nice to have it finally get to this stage. We started with a very low investment. We didn’t have a huge backing from the start, so to see three years of hard work and progress to now be what we’ve visualised is, yeah, satisfying,” David smiles. “There’s always one other thing though, isn’t there?” Chris says. “We want to streamline production, we’ll probably have to consider employing some people to assist cellar door – that’s a pretty big milestone, going from running our own thing to employing people. As big as 2018 has been for Imperial Measures Distilling, 2019 promises to be even bigger.